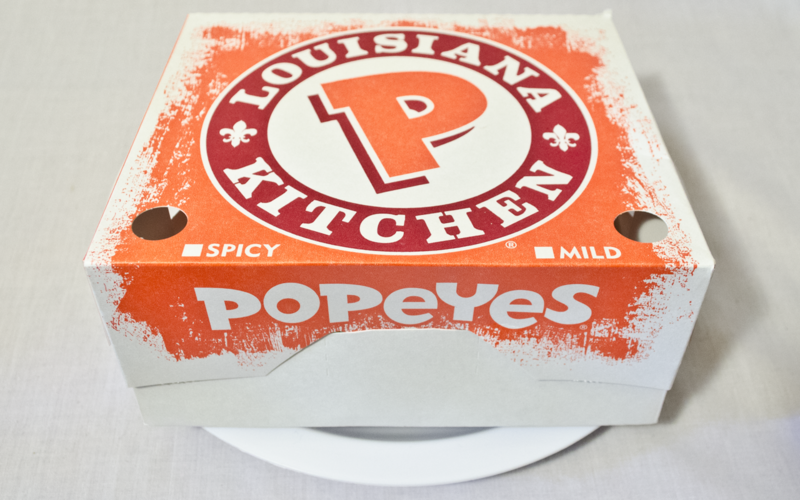 Popeyes seems to be taking a bit of a hiatus from new concepts: we saw that next month’s offering will be the Bonafide Big Box, which has already happened back in April. This is probably for the best, because their last few offerings (like the Smoky Garlic Chile Chicken and Hushpuppy Butterfly Shrimp) have been less than stellar. Will this semi-retro offering give us a tasty blast from the past, or is it resurrecting what should’ve been left in the grave? Find out after the jump. The Rip’n Chick’n was also promoted with new Habanero Ranch sauce, a standard ranch sauce with an habanero kick. We got our box for only $3.99, a huge step downward in price from previous offerings. The most prominent thing about the Rip’n Chick’n is that it is in the shape of a very terrifying-looking mutant hand. This is the inherent gimmick of the Chick’n: it’s a single chunk of chicken that has been sliced into strips that you rip off from each other, dip into sauce, and eat. The chicken, in itself, was actually pretty darn good! 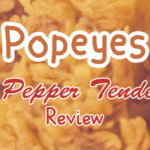 It was standard Popeyes fare: nice and juicy, not too greasy, and not bad at all. 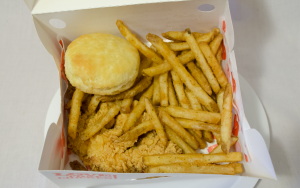 The ratio of breading to chicken, however, was very badly skewed towards the bread. Each bite of chicken was very crunchy and a little dry due to all of the crisp crust covering it, meaning that this is a Chick’n best suited for Dip’n. One thing we really did like was that the chicken was actually spicy! It gave us a very nice back-of-the-tongue tingle that lasted for some time while eating it. 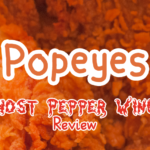 Popeyes has a good track record for making spicy food, but sometimes their more hot offerings are all spice and no flavor. That is not the case with the Rip’n Chick’n, which perfectly balances mouth-burning heat with moist and tender chicken. When dipped in the sauce, it all came together. The Habanero Ranch sauce was definitely a good fit for this. 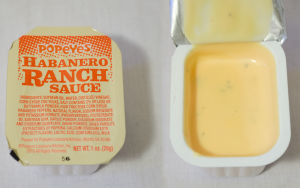 On its own, the Habanero Ranch wasn’t particularly spicy and had a somewhat earthy pepper paste to it. It tingled the lips a little bit but didn’t last. When combined with the heat of the chicken, the ranch truly came into its own to compliment the chicken’s own heat and balance out the breading’s dryness. However, spicy sauce on top of spicy chicken is a bit much with no real way to cool that heat off. It wasn’t overwhelmingly hot, but could be uncomfortable for those who do not enjoy spicy food. This combo is ones who truly love heat. Where the Rip’n Chicken really shines is with the value. An enormous meaty hand, a side, a biscuit, and dipping sauce is actually quite a fair amount of really decent food, and it’s even more special when you stack it against previous offerings like the Ghost Pepper Wings (which came with no side and a comparatively sad amount of bone-in chicken). 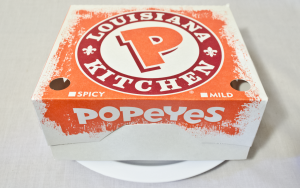 This isn’t our favorite limited time offering from Popeyes, because that honor will always go to their Beer Can Chicken, but it’s pretty damn close. 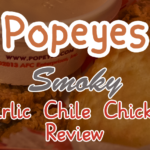 This chicken wasn’t the best chicken we’ve ever had at Popeyes, but for its price point, you’ll never catch us saying it was the worst. Spicy, flavorful chicken and tangy ranch sauce offset by overly dry crust and a lack of balance equals out to something that was overall mostly enjoyable. 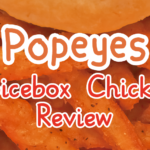 We’re glad that Popeyes decided to give the original Rip’n Chick’n another go, and we’ll be more than happy to give it another shot on the third come-around.